Numerous Florida body shops suing the nation’s largest insurers for allegedly “steering” and price-fixing have indicated they would like to refine their lawsuit further. During a status conference March 6, the collision repairer’s counsel in A&E Body Shop Inc. et al. v. 21st Century Centennial Insurance Company et al. indicated they’d like to motion for permission to amend their lawsuit. The case is being heard in the Middle District of Florida. The insurers said they would oppose giving the shops that chance, the court said March 6. “The motion, if granted, would moot several motions to dismiss that will soon be ripe for consideration,” Florida U.S. Magistrate Judge Thomas Smith wrote. He gave the collision repairers until March 27 to apply for the opportunity to change their lawsuit. The shops have already amended their case twice, most recently in early February. Smith was referring to three motions to dismiss the case filed March 4 by various combinations of insurance companies and a fourth filed solely by Geico. Those motions are in response to the February version of the case. The case is one of many similar lawsuits in different states being heard together by District Judge Gregory Presnell in what is known as a multidistrict litigation (“MDL”). MDLs are done to eliminate redundant legal work and costs on parties being sued for the same reasons in different federal districts. Despite acknowledging that a new lawsuit would make insurer arguments tailored to the February version irrelevant, the court still seems to be requiring the shops to address them soon. 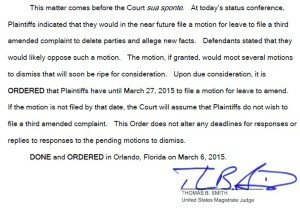 Three days after Smith set the March 27 deadline, the court gave the shops until March 13 to respond to the four motions, according to the docket. One of Presnell’s clerks gave Repairer Driven News an explanation for apparent contradiction, though he stressed he couldn’t be positive it was correct for this case: Though the court allowed the plaintiffs to apply for the chance to alter their lawsuit, there was no guarantee that the shops’ counsel would opt to do so. Hence, the court was still proceeding with the lawsuit in front of it for now. Of course, the collision repairers and their attorneys could always file a motion for more time, thereby pushing the response deadline out beyond March 27.